The Leeward Pilot Club presented a gift of thanks to St. Francis Hospice volunteers on Feb. 28. Their generous recognition is part of the organization’s “Pick Me Up” program, an initiative introduced by Pilot International 2013 to acknowledge and support family caregivers. The gift was presented at the St. Francis inpatient hospice facility in Nuuanu. 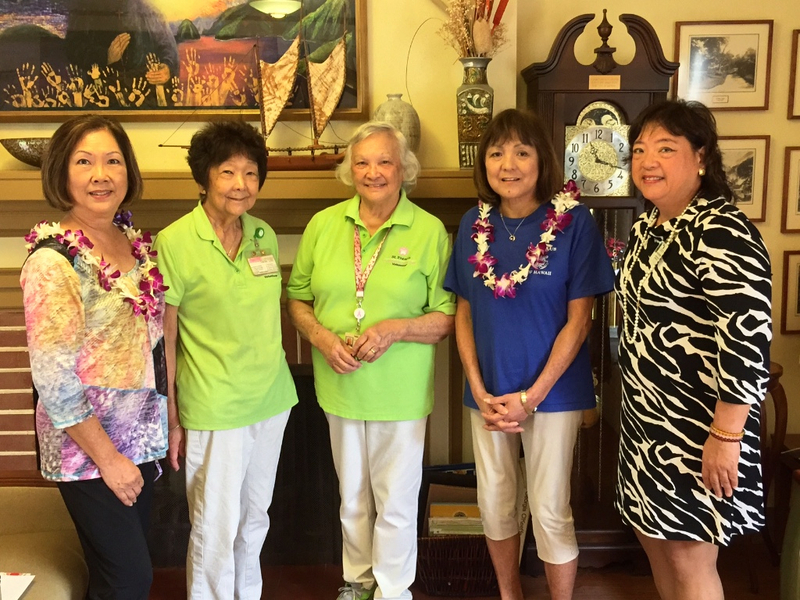 From left to right, Janice Arizumi, President of the Leeward Pilot Club; St. Francis Hospice volunteers Joyce Patrick and Rowena Okita, Sandy Luke, Membership Director of the Leeward Pilot Club, and Maylynn Wong, St. Francis Healthcare System’s Manager of Volunteer Programs. The Leeward Pilot Club is part of Pilot International, which was chartered on October 18, 1921 in Macon, Georgia, by Elizabeth Leonard and 40 local businesswomen. The name “Pilot” was inspired by the mighty riverboat pilots of that day who represented leadership and guidance. The Pilot International Foundation, now the Pilot International Founders Fund, was established in 1975 to further Pilot’s humanitarian efforts. Since the Pilot International Founders Fund grant program began in 1977, nearly 1,500 grants totaling more than $1.5 million have been disbursed. Mahalo to the Leeward Pilot Club!